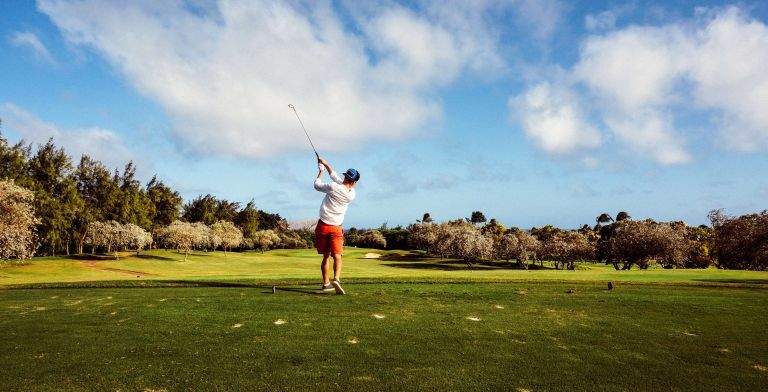 If you’re lucky enough to get in a game of golf on a nice sunny day, then you’re going to want to have a trusty pair of sunglasses on your to ensure you’re playing to the best of your ability. Golfing sunglasses are designed to give good coverage and contrast so that you can see clearly even on the brightest of days. For comfort and functionality, you want to look out for a pair of sunglasses that wrap around your face, these will allow for much clearer viewing without sunlight creeping in around the edges. For super clear vision, opt for polarised lenses such as the Oakley Half Jacket 2.0 XL, as they will filter out any glare so you can have full clarity on the course. If you wear prescription glasses, or find that some days you need a darker lens, then you may want to opt for a pair of golfing sunglasses with interchangeable lenses, like the Bloc Titan golf sunglasses. This means you could always have prescription lenses made if needed. Check out some of the best brands below that will ensure comfort and optimum visibility during your next game. These Oakley golf sunglasses are designed with comfort and clarity in mind. The half jacket frame sits comfortably on your face and they are lightweight to continue to provide comfort all day long. The HD polarised lenses work to deter reflective glare, so that you can see further without having to squint. The lenses are easily interchangeable so you can find ones that are right for you but these are sold separately. For a pair of golf sunglasses you that are both stylish and functional, Oakley is a brand well worth trying. The bright blue lenses of these golf sunglasses are designed to block out very bright light, so on those really sunny days, or cloudy but bright days, you won’t get the harsh white glare from the sky affecting your handicap. They feature UV protection for complete UV blockage and the thick durable lenses are scratch resistant so you can expect them to last you well. The non-slip tips will also ensure these glasses stay on your face no matter what your position and still won’t move even when they heat up. These are a great pair of sporting sunglasses for regular golfers. The Oakley Flak sunglasses provide great contrast and coverage across your peripherals, not only blocking out sunlight, but protecting you from any wind or impact. The lenses respond to the light levels and change accordingly to keep your vision clear whatever the conditions, and the stress resistant frame is designed to sit comfortably on both your ears and nose so they stay in place all day long. Those who often find it difficult to find sunglasses that fit their head properly may find these sunglasses to be a better fit. Many people with larger heads have said these glasses fit nicely, although they do seem to have shorter lenses than some golf sunglasses. Users like this as they get better airflow through the glasses and they don’t risk fogging up during gameplay. The curvature makes them comfortable on the nose and without the tinted lens people found it easier to read with them on, too. zIf you don’t want to spend too much on a pair of golf sunglasses, then these Bloc Titan glasses are great for the occasional golfer who wants protection from the sun. They are lightweight and flexible, meaning they fit on your face nicely and have an adjustable noise piece for soft positioning. The rimless edges help these glasses curve around the face, giving extra protection especially on those brighter days. For under £40 you can’t go wrong with this stylish pair of sunglasses.